This morning the sprinklers were on at our apartment. This is not unusual in itself as they are on most mornings, but this morning was different. As I approached my car carrying the baby in his seat I noticed that several of the sprinklers were missing their heads and shooting water straight up like a geyser into the air. 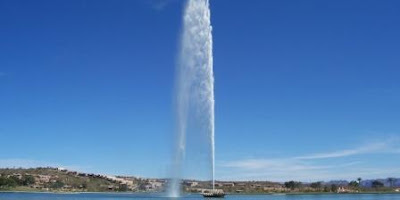 And one of these massive geysers was directly on top of my car and my car alone. I guess it was a free car wash, but how in the world in I supposed to get into my car with water splashing down all over the car, much less get the baby into the car without getting him soaked? Much like this, only imagine my car under the spray! I did manage to get into the car, baby and all, without getting too wet. If they would only tell me what days they were offering a free car wash, I would be sure to bring some soap and towels and make the most out of the opportunity. This is hilarious! Sort of.